To stop at a distance – why is that sometimes so difficult? We often have students who think it is a huge challenge to get the dog to work at a distance from them. They usually also think that it is difficult to get the dog to stop when she hears the stop whistle without first taking a few, or many, steps towards them. Many puppies also think that this is a little tricky initially. Some dogs seem to think that a stop whistle or hunt whistle means “I come to you and sit (or hunt)”. Reward REALLY WELL when the dog sits at a distance! Perhaps it is not so strange if you think about how you usually trained your puppy. Most of the time we have the dog very close to us when we train. We also want the puppy to be near us and we reward the puppy a lot when she stays close to us. That’s why we already from the beginning, when the dog is a puppy, need a plan how to teach the dog that it is natural to do things (that we say) even when the dog is at different distances from us. We simply have to teach the dog to do things away from us. These two exercises, which I will describe now, you might as well do with an older dog, even if it of course is great to be able to start with this training when the dog is very young. Bring a lot of quite large tidbits for your training. Let the dog sit close to you a couple of times and reward the behavior. Throw a tidbit one yard away from you. As soon as the dog has swallowed the treat say, “sit”. If the dog sits down without taking a step towards you reward the dog a lot by throwing a tidbit over his head. While the dog turns around to take the treat you take a couple of steps away from him. When the dog has swallowed the treat say, “sit” again. Reward the dog by throwing a treat over his head but this time a little further away. Reward with loads of tidbits when the dog sits down in the distance. In this way, you can step by step increase the distance between you and the dog. You can do a lot more repetitions of the exercise if you let the dog sit at the distance from you while you threw tidbits, than if you throw a ball and the dog must bring it to you. However, it might be a good idea to vary sometimes and for example throw a ball or walk up to the dog and play with him where he just sat. Here is a film where you can see when I train my dog Tassla to do things at a distance from me – and at the same time I test her understanding of the different cues by mixing them. That’s a fun to do when the dog is at a more advanced level. But what do you do if the dog still takes a few steps towards you before he sits down? If the dog starts moving towards you try to “wave her away” from you before you say, “sit” again. You should of course reward the dog for being “waved away” by shouting “good dog” and throwing a treat to her and then immediately say, “sit” when she has swallowed the treat. If it still doesn’t work there is another fun and easy way to teach your dog to do things at a distance from you: Using a target. (Then you can return to the exercise above). It doesn’t matter what kind of target you use, there are advantages and disadvantages no matter which one you choose, so take one that you think suits you and your dog or teach your dog many different types of targets. I think that the classic mouse pad is very useful but also an agility pole, a plastic bottle, a bucket or anything else that the dog can run up to and dab. I have for instance sometimes used my tea thermos. The advantage of a target is that it is easy to learn, but the problem is that it is a very good help and therefore easy to get stuck with. So remember, it is important to get rid of the target quickly. Click so that the dog gets interested in the target. The first few times you can click as soon as the dog approaches the target but the goal is that he should dab a paw on the target. You can play with the dog on the mouse pad as a reward and sometimes you can give the dog a lot of tidbits when he remains on the mouse pad. When the dog is happy to be on the target and deliberately puts one or more paws on the mouse pad it is time to put the target a little bit away from you. You can either ask an assistant to help you or hold the dog in the collar yourself while you put the target as far away from you as possible and you can also throw a treat to the dog and while he eats it you can move the target. Then you move the pad further and further away from you and the dog. At the same time as you increase the distance between you and the target you can begin to ask the dog to do things when he dabs the pad. You can for instance, say “sit” and reward the dog on the pad when she sits on it. Begin with a short distance before you try to combine the cue with a distance further away. When you have come this far, you can start using the target when you cast the dog. This means that you let your dog run towards the target but before he reaches it, you call the cue or blow the stop whistle. Take the opportunity to ask your dog to do things whenever he is at a distance from you – it could be either on a walk or at home. 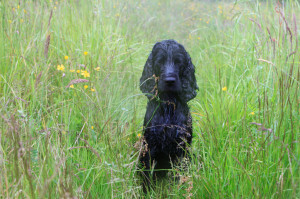 If it is easy for the dog to do things at a distance from you in everyday life it won’t be a problem for her to do so during the gun dog training. A friend of mine taught her dog to work at a distance from her by putting a wire grid in the kitchen. The dog stood on one side of the grid and my friend on the other side. She moved slowly in to the living room and said, “sit”. After a while she could remove the grid and the dog stayed in the kitchen and sat down when she asked him to. That’s a good start! Hi Lena, very interesting post. I am perplexed about one thing in your account. Why do you emphasize that the dog should have swallowed the treat before giving another command? Why don’t you just give the new command as soon as the dog finds the treat? Are you pausing so that the dog will turn to face you? But if that is the case why are you also giving a verbal command. Wouldn’t the hand signal alone suffice? I use to wait until the dog has swallowed the treat because I want her to be ready for my next “order”: When the dog is still chewing it could be harder for her to follow, in my experience. If I give the new command at the very second she finds the treat I think I´ll be a little mean to her – she is still occupied by finding and eating the treat. And I want her to succeed, therefor I don’t say it at the same time. But its about seconds of course. After a while you learn how your dog looks like when its “ready to go” and can do another repetition.